Modeling their ways of life on those of the Prophet Muhammad and of the first generations of Muslims does not necessarily give recent online Salafist activists the reputation of being modern. Labeled as anti-modern in mainstream media discourse, their use of new media often is associated with selling out to the West or with being hypocritical for arguing against Western values on new media platforms, which apparently are owned by the West. If we buy into those binaries, Salafist goals seem to be a mess of contradictions: they advocate a 1400-year-old lifestyle and claim to be modern, and they attract Westerners to oppose Westerners using consumerist and media language attributed to the West. Mainstream media’s master narratives of these opposing forces perpetuate rich neo-Orientalist and postcolonial discourses of conflicts between the West and the rest. As a response to those claims, some online Salafist networks in Germany, the UK, and in Tunisia insist that their use of technology is in line with Islamic customs established by the salaf (predecessors). They verify the validity of their creed by projecting historic concepts, such as dawah (outreach) and jihad (struggle), as timeless, authentic, pure, morally superior, and modern. At the same, they authenticate their new media usage as a continuation of Islamic precepts given by the prophet Muhammad. 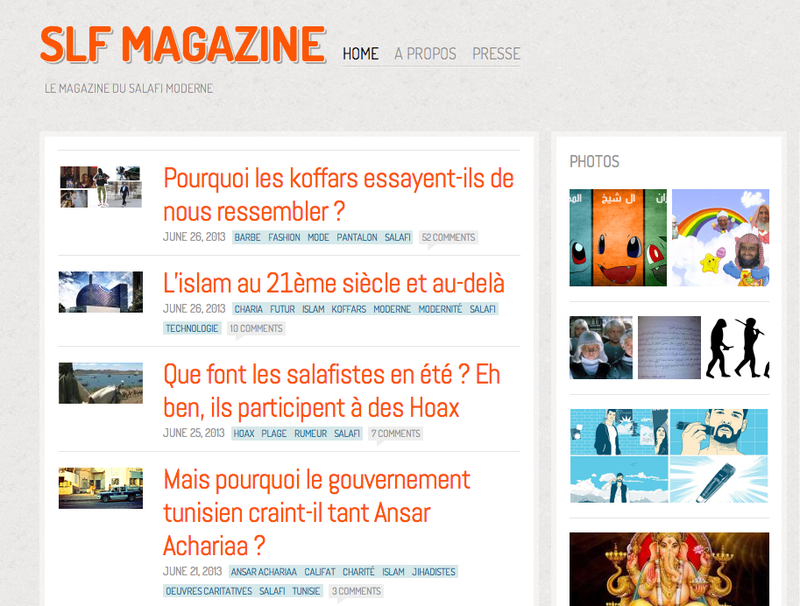 One of these online communities is the Tunisia-based WordPress blog SLF magazine, or Le Magazine du Salafi Moderne (The Magazine of the Modern Salafist). S-L-F is the Arabic root for salaf – not to be confused with SELF magazine, a women’s magazine offering fashion, beauty, health, or nutrition advice. The Salafist bloggers claim that the magazine dissects codes, customs, and interests of modern Salafists in Tunisia and in the Francophone world. 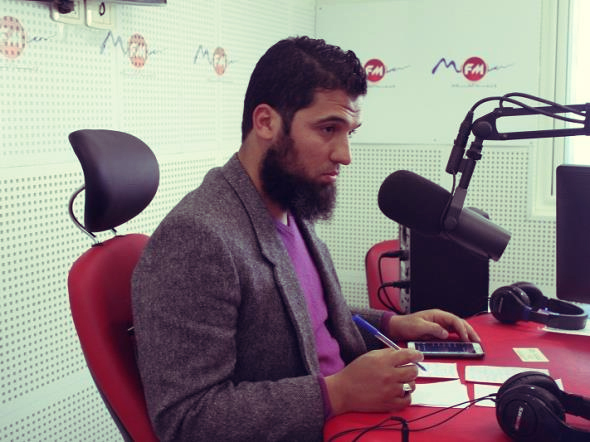 Youssef Mazzouz, who identifies as a Salafist and as the Imam 2.0 of the Mosque Fatima Azahraa, was interviewed by SLF Magazine on how he championed the cause of modern Salafism in the media and how one can follow the salaf and move with the times. Mazzouz practiced Islam since he was eight years old and learned to memorize the Qur’an between the ages of ten and twenty. Jokingly, he reassures that his technology, such as his Samsung Galaxy notebook or his radio equipment, is totally up to date. He describes YouTube, Facebook, or Twitter as indispensable for Muslims in conducting dawah. Although he acknowledges the criticism he receives from other Muslims about his use of media, Mazzouz believes that these Muslims will eventually accept him since he follows the prophet Muhmmad’s principles of dawees (Muslims conducting dawah) using all available means to receive and distribute Islamic knowledge. Abou Hamza Al Tounissi, one of the most frequent bloggers on SLF Magazine, ponders the development of Islam in the 21st century and beyond. He proclaims that he could see himself going to the mosque in a flying saucer in the future and ridicules laïcards (roughly translated as secularists) who associate Muslims with the Sahara and camels or are shocked when they see a brother on an iPad or wearing Nike shoes. Without Muslims, he argues, the peoples of Europe would still be in the Middle Ages and would have never even become human beings. While hospitals in Islamic Andalusia had the best health care system, the finest doctors, and impeccable hygiene, the French died of a common cold. Paris was the capital of stench, which resulted in the invention of perfumes to reduce foul odors. Muslims had Sharia law, which he describes as the fairest in the world, while the French settled their disputes through duels. He concludes that modernity in Islam has nothing to do with imitating the West, but with Muslims foolishly giving up parts of their religion in an attempt to please kufars (non-Muslims). Al Tounissi also legitimizes jihadists as superheroes of modern times. As superheroes, they help those who need it most, defending the widow, the orphan, the oppressed, the forgotten, and the unjustly imprisoned. As superheroes, they learn how to handle powers they had no idea they had. 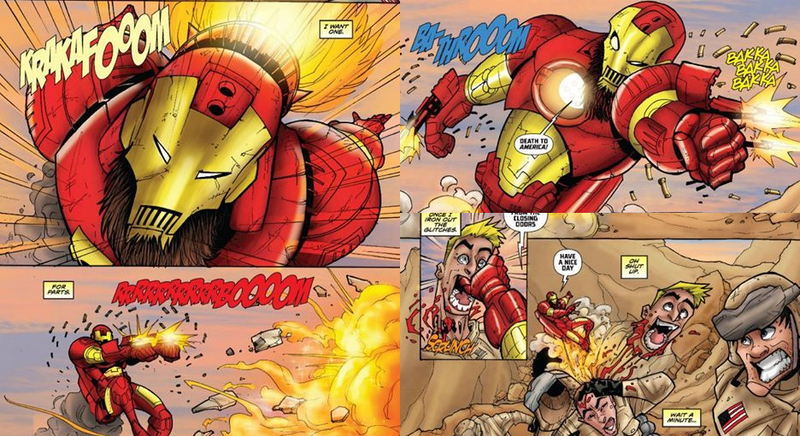 As superheroes, they have nicknames that instead of ending with “man” (Superman, Ironman) end with “Muslim,” such as Super Muslim or Iron Muslim (see picture) or begin with “Abu,” such as Abu Yahya al-Liby, Abu Mossab az-Zarqawi. As superheroes, they have the war cry “Allah Akbar.” As superheroes, they wear atypical costumes, referring to their qamis (tunic) and long beards. As superheroes, they would give their lives to save others. And as superheroes, they have a logo: the signal of the oppressed in the sky reflected in the moon as a cry of distress (appropriating the Bat sign). Like their Western counterparts, Salafi superheroes are timeless heroes with superior values, strength, and morality, and will continue their work into eternity. They leave their ordinary lives as students, taxi drivers, butchers, or nurses to fly to unknown lands to stop endless fighting. Two years have passed, Al Tounissi writes, since the beginning of the crisis in Syria and no nation has interceded. But he ultimately understands the reasons: these actions are for people with super powers — real Salafi super heroes. 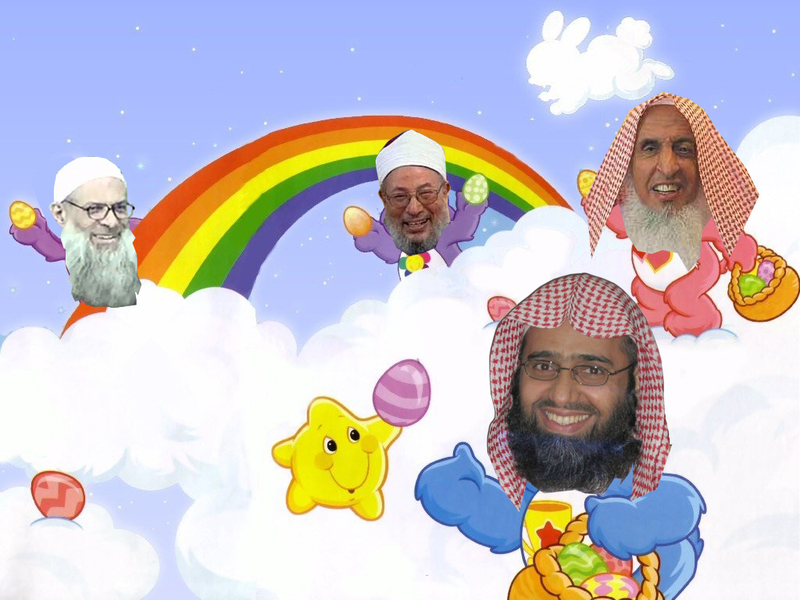 In an attempt to delegitimize other interpretations of Islam, as well as Sunni, Sufi, or Shia Imams, Al Tounissi draws on more popular culture — Care Bears and Pokémon — to ridicule the Imams’ customs. Calling them Pok’imams (Pokémon Imams), he describes them as puppets of Arab governments and as deceiving masses of ignorant Muslims. When left to themselves, Pok’imams talk about the dialogue among civilizations, similarities amongst all religions, spirituality, and peace in the world. Al Tounissi sharply denounces their neglect of addressing the situation of Muslims in the world, the pride of Muslims, the obligation of jihad, the predominance of Sharia, and the importance of studying Islam. Not without a healthy dose of sarcasm, Al Tounissi discredits their type of Islam as Bisounours (Care Bears) Islam, Barbie Islam, toothless Islam, Islam with hearts and butterflies, a Coco Chanel No. 5 Islam, a soft, gentle, hippy Islam, a Sufi Islam, an Angelina Jolie, Mother Theresa and Mahatma Gandhi Islam, a ThanxGiving and Merry Xmas Islam, among others. Islam is at once timeless and ahead of the times, Al Tounissi furhter asserts. When he was flipping through a male fashion magazine, he noted the newest male fashion developments in France and other Western countries and concluded that kufars want to be like Salafists. Western fashion designers copy Salafist dress codes: men let their beards grow and shorten their pants. He points to the American actors George Clooney and Hugh Jackman, as well as to the sports celebrities Lebron James and David Beckham, whose beards resemble the dense beards of Salfists and not the George Michael two-day beard. 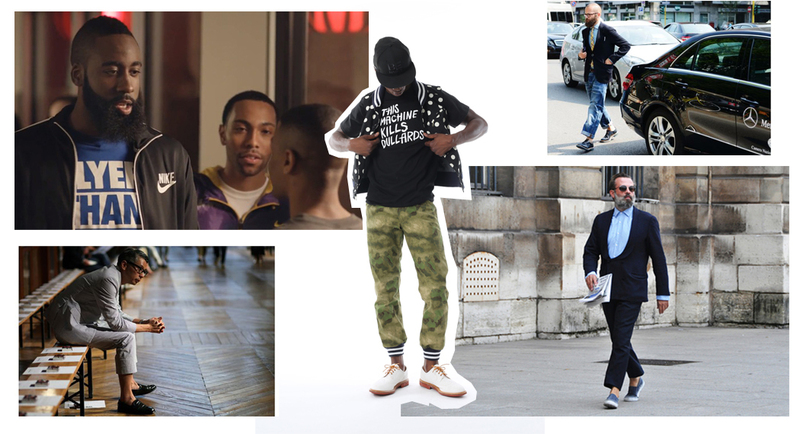 Al Tounissi poses the rhetorical question of whether this fashion fad was formed in the twisted brains of high fashion moguls who are short of ideas or whether it is rooted in Islamic precepts involving facial hair for men. He continues by arguing that kufars also shorten their pants to look like Salafis. 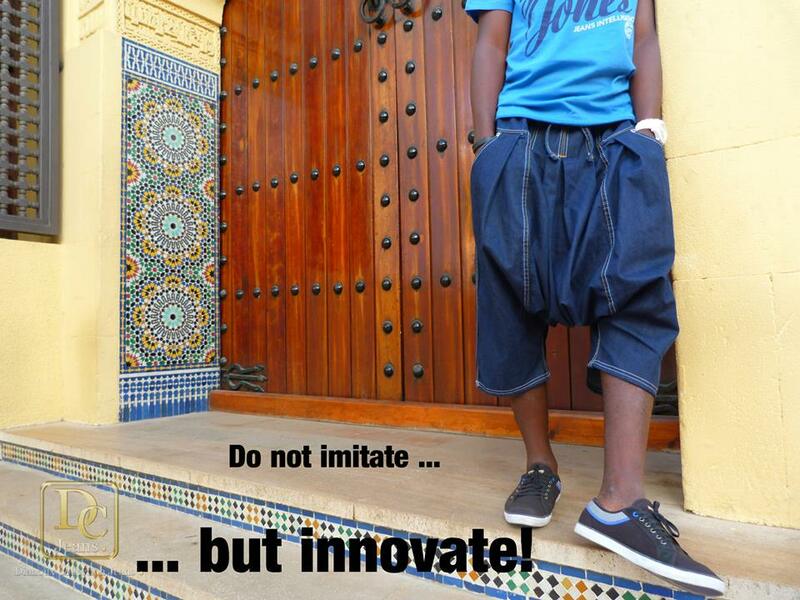 Indeed, even jeans and sweat pants now stop at the ankles, which is also in line with Prophet Muhammad’s hadiths and with fitrah (instinct). He concludes that the Salafi ummah is the best that is sent to mankind and no one can prevent the kufars to be subjugated. Salafi fashion designers are not far: Dianoux Collections (DC), for instance, announces the revival of sirwal as a creative, artistic, and original idea: it is the perfect blend of classic and modern. Sometimes called punjabi pants, these baggy pants have been worn in the Arabian Peninsula since before the Christian era. They can be worn by men under the thawb, which is an ankle-length, robe-like garment predominantly worn in Arab countries at the Persian Gulf. According to the DC website, the sirwal may also be worn with a shirt or an Afghan qamis and come in many materials (jeans, camouflage, light fabric) and in many colors, from the classic khaki to blue, yellow, green, white, black, and pink. In a more serious tone, Al Tounissi calls other Salafists to fight incessant manipulations on both policy and media levels. He asserts that jihad should not be limited to geographic areas of conflict, but has to be fought in online environments as well. The Internet has the ability to bypass traditional media outlets that have been previously inaccessible to jihadists and used by propaganda states to discredit the mujahideen or to cater to their Western masters. 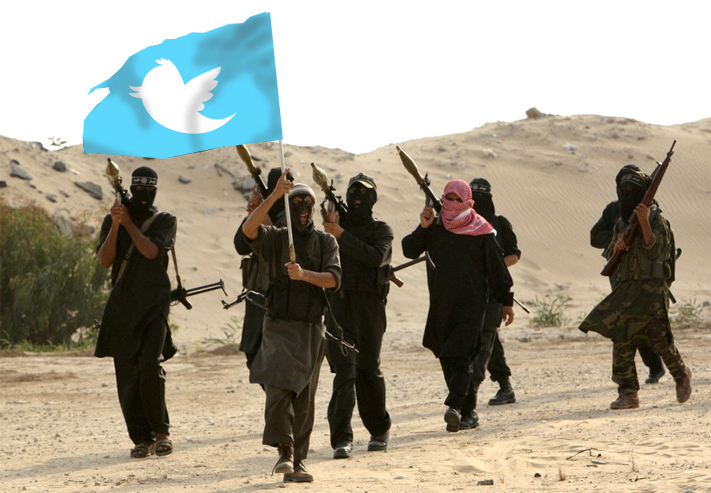 Now, jihadi groups should use Twitter, Facebook, and YouTube to broadcast information from the front lines. Al Tounissi mentions how new wave of young Western jihadists flew to Syria to fight against the regime of Bashar al-Assad, ended up directly on the battlefield, and detailed the fighting, the number of deaths, the liberated cities, or the acquired weapons. In June 2012, the mainstream media tried to cover up a large-scale attack that took place against Fort Salerno in Afghanistan, but the entire operation was captured by the mujahideen and emerged a few days later on YouTube. Al Tounissi also praises the skills of jihadi hackers and their virtual attacks that led to the relatively new concept of “cyber-jihadism.” Cyber jihadists, he elaborates, have hacked the websites of governments and financial institutions. He describes several recent attacks: “Mauritania Attackers” launched a cyber attack in April 2013 named #OpIsrael that blocked access to several Israeli sites. 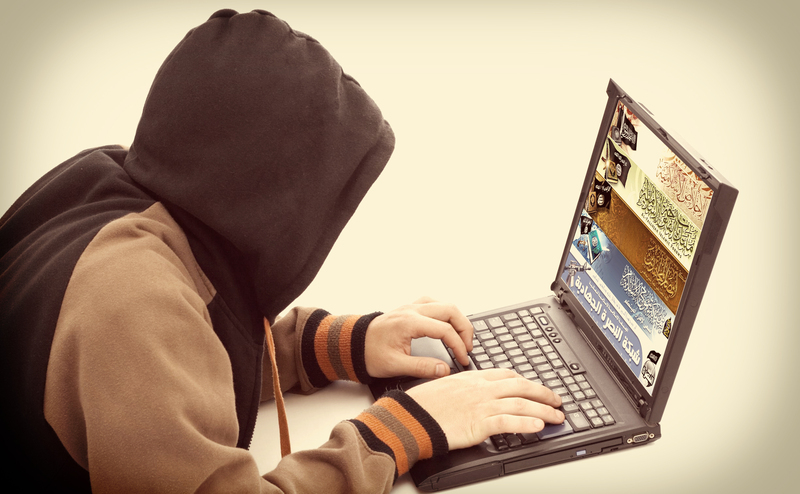 They have been able to neutralize more than 10,400 domains, making them one of the most active group of hackers in 2013, according to the Cyber Defense Magazine. In March 2013, a group called the Electronic Army of Al-Qaeda called for a massive campaign of cyber attacks against financial and US Government sites. The “Tunisian Internet Army” participated in the operation and claimed responsibility in the attacks against the website of U.S. Customs and Border Protection. “TeaMp0isoN” operates in Palestine, Kashmir and other Muslim majority regions prone to conflict. Between 2010 and 2012, the group targeted NATO, as well as government agencies and anti-terrorism departments in the UK and U.S. They obtained confidential recordings of conversations between British anti-terrorism forces and law enforcement, now featured on YouTube. ← I don’t care what you believe. Just believe in it.